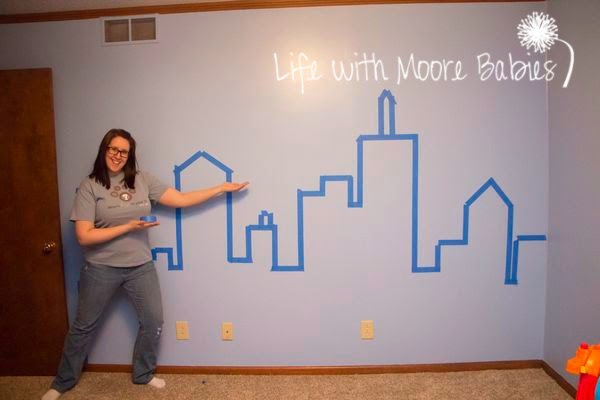 When we moved my little man insisted on having a blue Batman room. While Batman is his favorite, he really likes all super heroes, and there is no way my husband would let me leave Spider-man out! 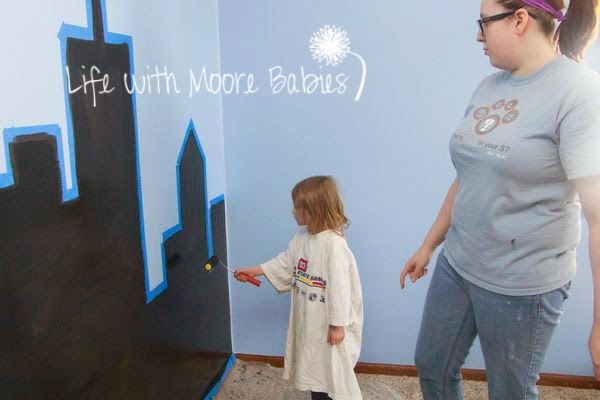 We lucked out getting a great Batman canvas on clearance, but the other little details of the room were all do-it-yourself. To start with we painted the walls a lighter shade of Batman blue; then I turned my attention to his little race car bed. 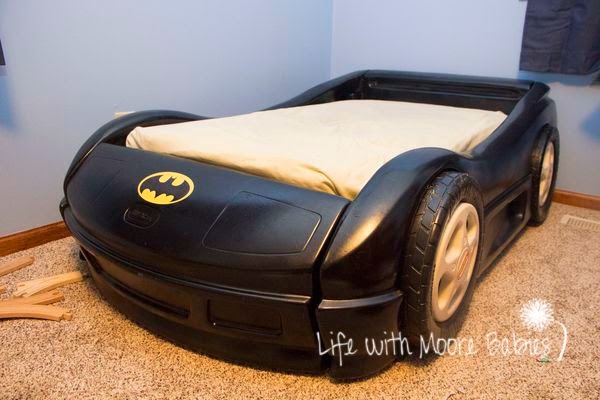 I decided, I could easily re-do the bed to make a Batmobile! 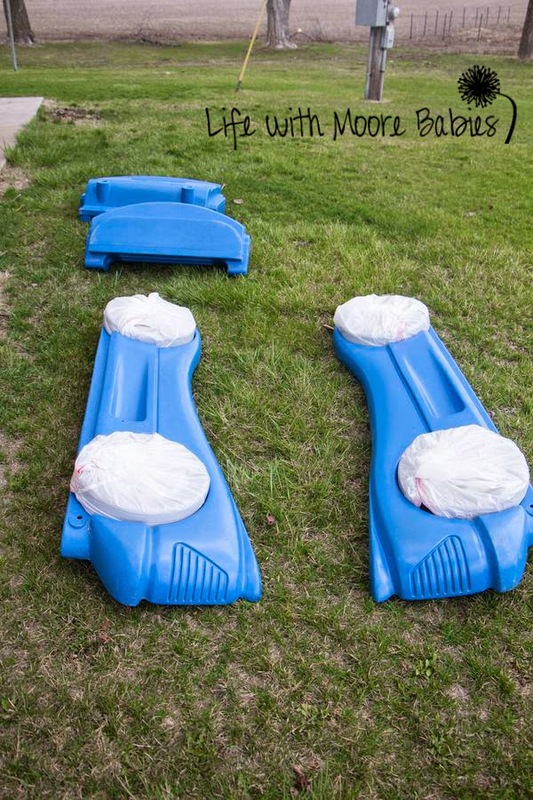 To start with, I wrapped the wheels in trash bags. 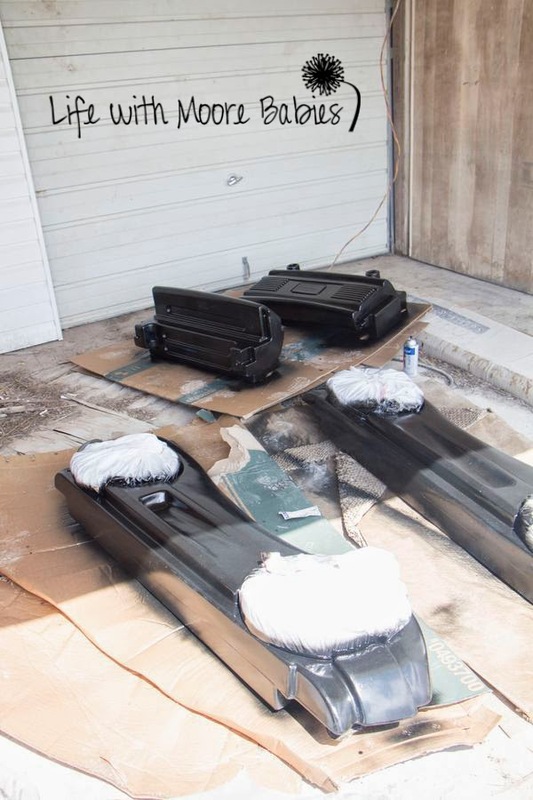 Next, I painted the rest of the bed with glossy, black plastic spray paint. It needed a couple coats, and you want to make sure you follow the instructions on the can. Our plastic spray paint wanted all the coats to be done in rapid succession, so no drying in between. In fact, if you let it dry and then add a second coat it will be more likely to peel. Once it was painted and put back together, I adhered a cute little bat signal vinyl decal, and ta-da, Batmobile! 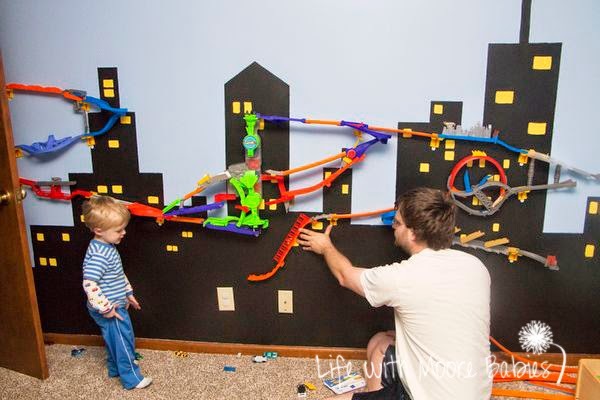 The second project I took on in this room was a cityscape complete with his hot wheels wall tracks. 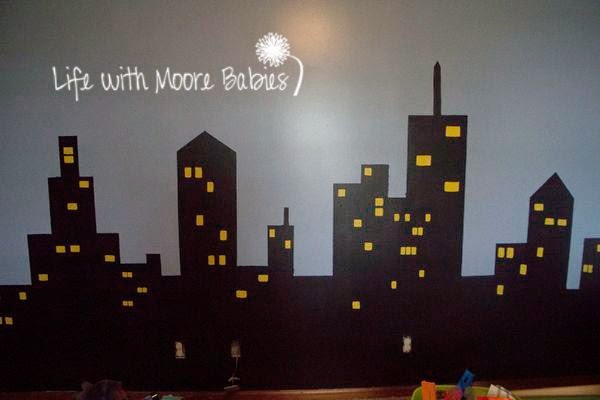 To make the cityscape, we started by taping off buildings with painters tape. We could have completely drawn it and used a straight edge to make it exact, but we felt we could get close enough eyeballing it. Then we painted the buildings black (I got a quart of paint for the black). 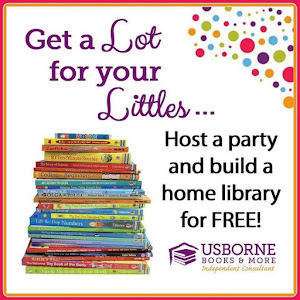 Since you just had to stay in the tape even the littles could help. After two coats, I went through and painted some windows in yellow (a little sample jar of paint was the perfect amount). I intended on using a stencil for the windows, but ended up fee handing them. I just randomly chose places for windows trying to make them different between the adjoining buildings. Once it was dry my husband got to add the car tracks. This was a great job for his inner child. Honestly, he doesn't keep it in very well; he loves these car tracks almost as much as Spider-man. I also plan to add a Bat Signal above the city as well. I think I will just use another vinyl one. 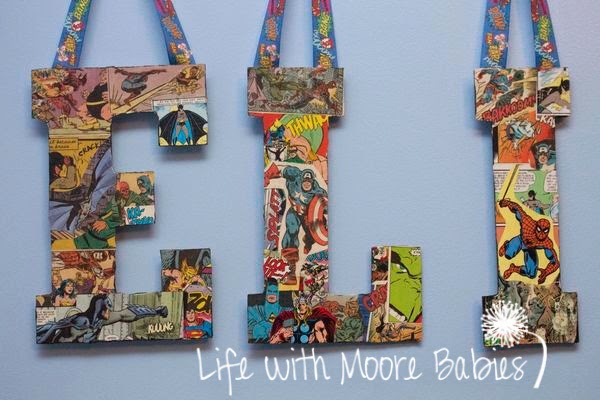 The third project I did for his super hero room was to personalize his name with comic book scenes and characters. 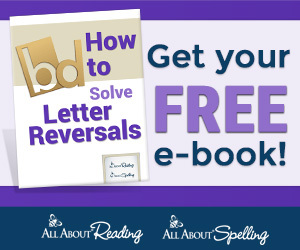 I started with wood letters and painted the edges black. Then I went through random comic books picking out various pictures to mod podge over the top. Since you use so many small pictures you don't have to have the best or most expensive comic books; just grab a big lot of random ones. To add the pictures, I put on a layer of mod podge, added the pictures, and finished with 2 more coats of mod podge (allowing it to dry between coats). Once it was dry I added some cute ribbon to hang them from. 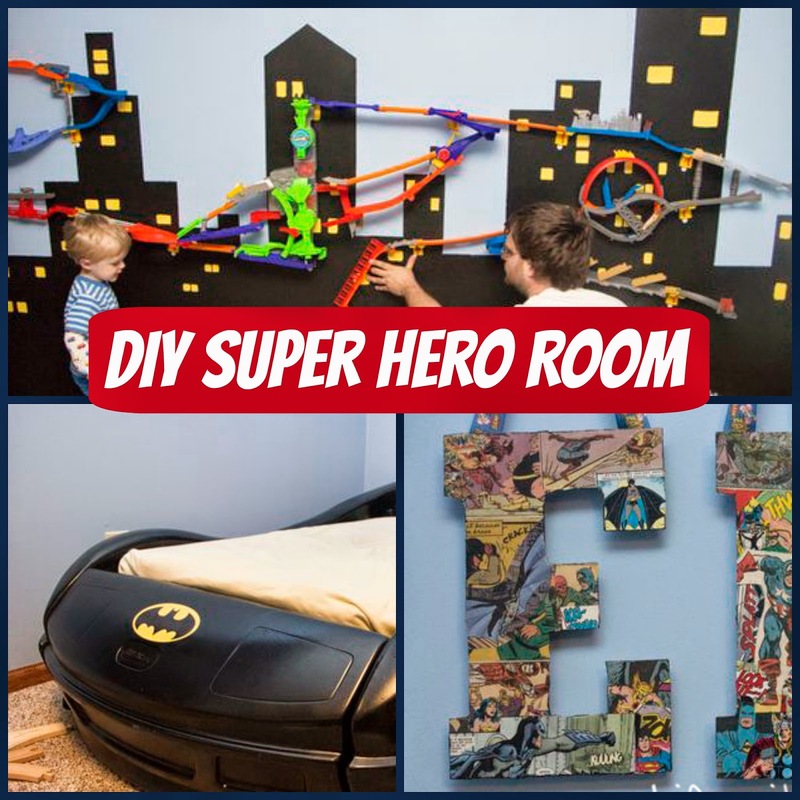 Nothing in this room was too expensive or difficult, and he loves his super hero themed room! 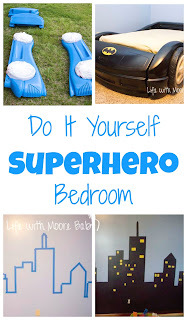 Plus we found ways to incorporate Batman, Spider-man, and many other super heroes!